Ambiente Blog Ambiente Blog • Nightlife between station and banks. Frankfurt is more international than any other city in Germany. Taste the cosmopolitan flavour on a culinary journey through the Bahnhofsviertel district – where opposites meet and the diversity of Frankfurt is concentrated in a small area right next to the Messe exhibition centre. Between the Westend district on one side and the River Main on the other lies a neighbourhood that displays a bewildering diversity. Bahnhofsviertel near Frankfurt’s central station offers a trip around the world in just a few square metres. People from almost a hundred different nations live together here peaceably between the red-light district and the city’s high-rise banking buildings. From the exotic grocery stores on Münchener Strasse to the table dance bars on Taunusstrasse is only a few minutes’ walk. But this former problem district, where many different layers of society meet, continues to develop as Frankfurt’s cultural hotspot. 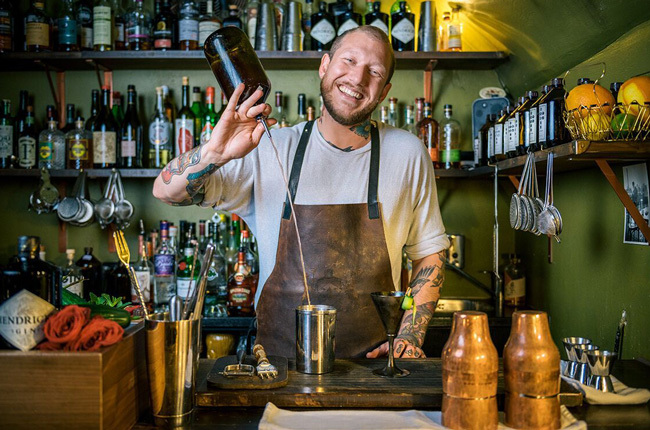 This is not just because of its young and open-minded inhabitants from all over the world, but also because of its international cuisine and the fact that the best bars in the city are to be found here. When Frankfurt’s monumental central railway station (Hauptbahnhof) –at that time the largest in Europe – opened at the end of the 19th century, it was surrounded by a district that boasted many hotels, cafés and restaurants. During the German Empire, around 10,000 people lived in the magnificent “Gründerzeit” buildings that characterised the area around Kaiserstrasse. During the Second World War, though, air raids destroyed much of the area and it descended into a red-light district with numerous empty apartments. The cheap accommodation attracted newcomers from abroad who brought a piece of their culture to the neighbourhood, giving it the cosmopolitan charm it possesses today. Kanwal Gill grew up in the Bahnhofsviertel area, where his parents owned a shop selling Indian fabrics and clothes. In 2015, he opened the eatDOORI in Kaiserstrasse, an Indian restaurant in the same premises in which his parents used to run their business. The restaurant has a product table reminiscent of the vegetable trolleys on Indian streets and the toilets are designed like old Indian railway coaches. It offers not only the traditional classics of Indian cuisine, but also lots of street food dishes. Just around the corner is Lam Frères, one of the best Vietnamese restaurants in the city, where you can roll your own summer rolls. A few streets away, you can feel the heart of Africa beating. Specialities from Eritrea are served in the restaurant “Im Herzen Afrikas”, whose interior is reminiscent of a tree house. One of the most popular dishes is the mixed platter on which the restaurant’s signature dishes are served in small portions (vegetarian option is available). The Bar Shuka can be found at the other end of the district. 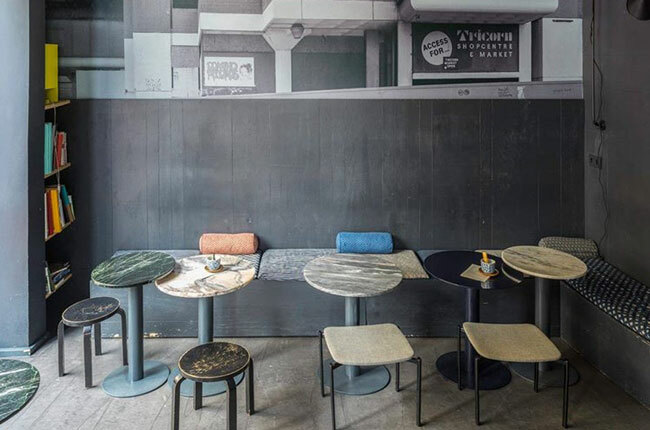 It is run by the two Ardinast brothers – who also operate a handful of other restaurants in Bahnhofsviertel – and can be compared with Israeli markets. It blends local Hessian cuisine with oriental influences. 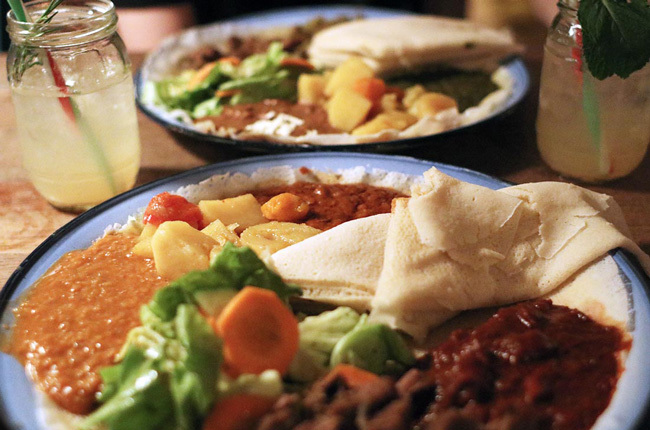 The brothers boast the freshest pitta bread in the city. It is served with “green sauce”, a regional speciality made of fresh herbs and sour cream, refined with their own Israeli taste – the best of both worlds. For as proud as the restaurateurs in the Bahnhofsviertel are of their diverse cuisines, they are also proud of their home in Frankfurt. The neighbourhood between Taunusstrasse and Gutleutstrasse is not only a transit point for thousands of travellers every day, but also a great place for an enjoyable lunch break. When Frankfurt bankers clock off at lunchtime, hundreds of them stream into the Bahnhofsviertel district. 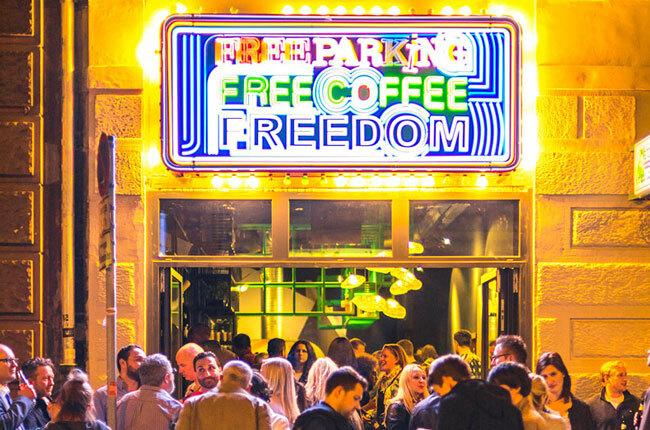 For instance, into Pizzeria Montana whose door is emblazoned with a large neon sign by artist Tobias Rehberger that promises “Free Parking / Free Coffee / Freedom” and has certainly misled many a visitor. Instead of parking lots and coffee, there is only pizza – but it is good pizza. The oven comes from Naples, the mozzarella from nearby Offenbach. Like Pizzeria Montana, many specialist snack bars have set up that have little in common with the normal fast food outlet: At Mian, for instance, there are handmade Chinese noodles, at Taunus 25 there is currywurst from a country butcher and Falafel 1818 offers not only Mediterranean dishes (vegan options available), it also provides a quite unconventional service – long drinks to take away. Although Frankfurt is located several hundred kilometres from the nearest coastline, it surpasses almost every other German city in terms of the variety of fresh fish available here. This is primarily thanks to the proximity of a major airport from which fresh seafood is sold directly, for example to the fish restaurant Hamsilos & Schenk (with daily specials) or to Walon & Rosetti, whose menu always has a distinctly seasonal character. Fresh fish is also available at Kabuki, one of the oldest and best Japanese restaurants in Frankfurt. 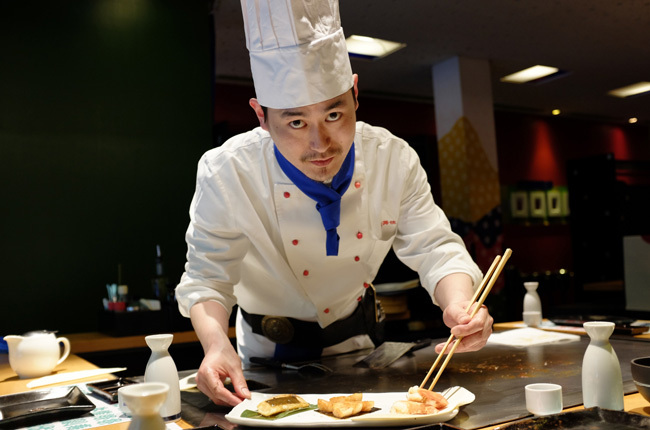 The food is cooked “Teppanyaki” style here, which entails the beef, poultry or seafood being carefully prepared and served by chefs on an iron griddle in front of the guests – without pretention but with superb flavour. The high standard of cuisine here has also attracted Michelin star chefs. Restaurant Weinsinn moved from the up-market Westend district to the lively Bahnhofsviertel and promptly lost its star – Guide Michelin couldn’t initially find it at the new address. 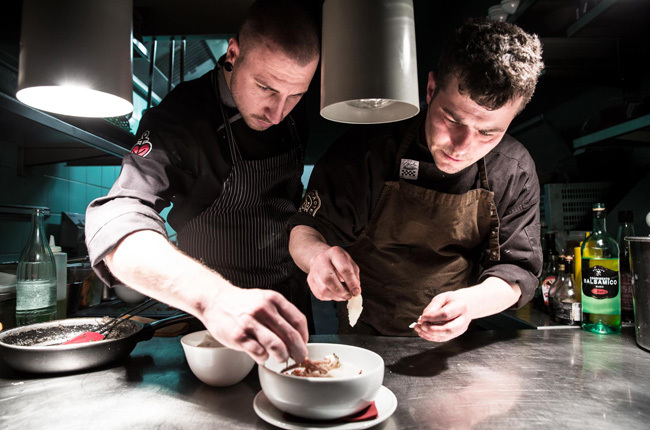 The new chef Julian Stowasser, who had previously worked as a top chef in Munich, now looks set to get the star back. 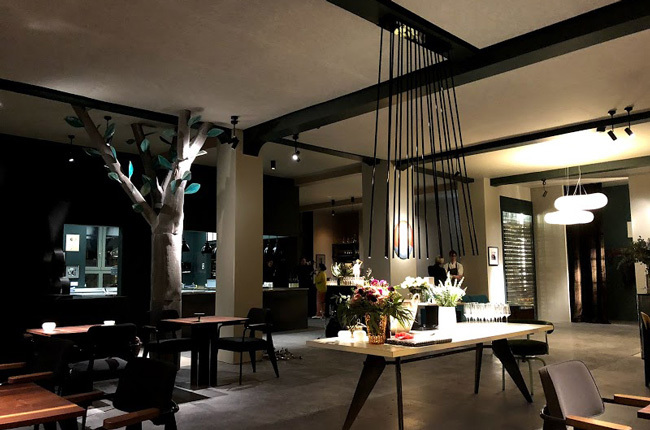 With its modern interior, which unfolds around a tree sculpture by Anselm Baumann, and its friendly, unhurried service, it is one of the best restaurants in the city. 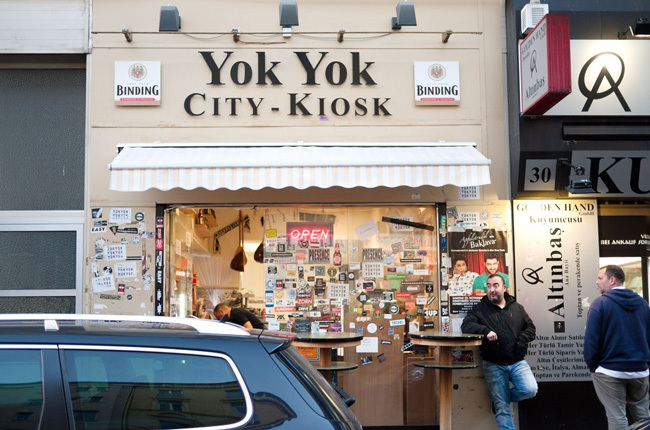 If you want to meet up with Frankfurt residents after dinner, you can go for a beer at the Yok Yok kiosk, a few yards down the road from the Restaurant Weinsinn. The name of the kiosk means something like “Nothing doesn’t exist” in Turkish, and as well as snacks, it also sells 300 types of beer from all over the world. The owner Nazim Alemdar has lived in the Bahnhofsviertel district for 36 years and welcomes every guest like part of the family. Drinking continues on the sidewalk in front of the kiosk until late into the night. A few blocks further on, down in a dark cellar on Elbestrasse, the atmosphere is a bit more up-market. Here the Kinly Bar hides behind an inconspicuous black door. You need to ring the bell to gain admission after which you descend the stairs into the cellar. There is no mobile phone reception, but there are first-class cocktails and – if you’re hungry – hot dogs, too. Alternatively, it’s worth taking a detour to Giulia Super right next to the station, a promising new addition to the Frankfurt bar scene. And then, of course, there’s always the Plank, one of the original hip venues that contributed to the reinvigoration of the Bahnhofsviertel. Still today crowds of people gather in front of the bar. 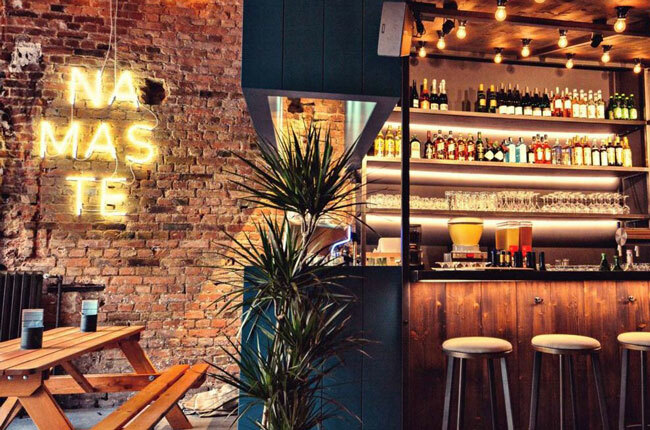 This corner restaurant was founded by the well-known DJ Ata Macias, who has since retired from the business. Through the window seats in winter or at the sidewalk tables in summer you can watch the world go by and witness the diversity that gives the Bahnhofsviertel its unique character. 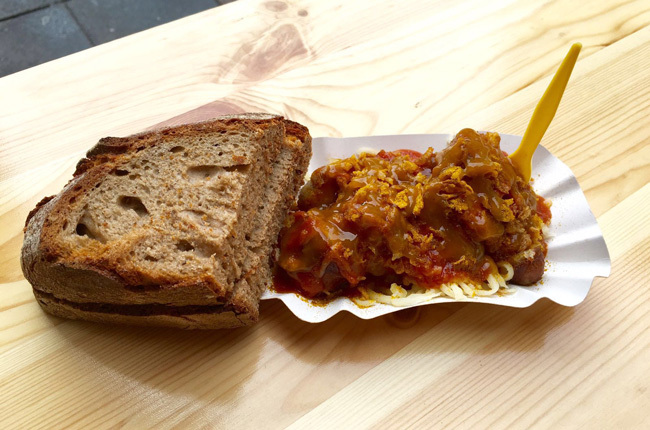 A small neighbourhood, but one that has distilled the essence of Frankfurt – a place where people aren’t afraid of new and unfamiliar things, a place that is alive 24 hours a day. The Bahnhofsviertel makes Frankfurt Germany’s only truly global city.